Paul George Konody was born in Budapest in 1872 and educated in Vienna before settling in London in 1889. From 1900 to 1902 he was editor of The Artist, and he was later an art critic for The Observer and the Daily Mail before the First World War. In 1914 he was one of three critics to be 'blessed' by Wyndham Lewis in Blast No. 1, and in 1917 he played an important role in Roberts being commissioned by the Canadian War Memorials Fund to paint the large-scale The First German Gas Attack at Ypres in 1918. He died in 1933. 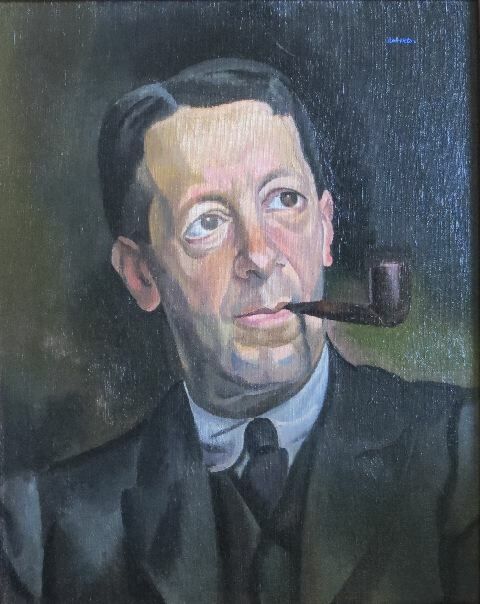 This portrait was presumably painted after Roberts's war-artist work, and when exhibited at the Chenil Gallery in 1923 it was priced at £35. The painting has been in the Konody family since that date, although until recently art historians believed it to have been lost.